Mercury retrograde is often accompanied by superstition and anxiety about all sorts of things going awry. Mercury retrogrades about three times each year for approximately three weeks, so how can we learn to flow with this energy and use these periods constructively. When a planet retrogrades it appears to be moving backwards through the zodiac from our perspective on Earth. This occurs due to the relative speeds and positions of the planets involved, which are in fact both moving forwards in their orbit around the Sun. The retrograde phenomenon is all about the position and perspective of the observer. 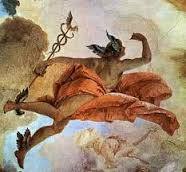 In mythology Mercury or Hermes was the swift messenger of the gods who had a sort of “access all areas” pass and could move freely between the depths of Pluto’s underworld and the heights of Mount Olympus. In astrology Mercury symbolises connection, communication, speed, agility, networking; the mover of information. Mercury also rules business and commerce (mercantile or merchant) and is associated with the trickster archetype (the Magician in the Tarot). In personal astrology Mercury symbolises the mind and how we think, communicate and connect. When this energy slows down it can appear to us that things are moving backwards in our lives. Our business may not be moving as fast as we would like, opportunities may not be progressing, things may not be happening as we had planned. Life seems to have stalled and we feel frustrated and anxious. Try taking another perspective. I’ve been using this Mercury retrograde to catch up on all the things I had put off until later; doing my tax return, going over finances, updating my computer, catching up on reading and articles. With less distraction and busyness I’m allowing myself time to contemplate and enjoying the slowness. Mercury retrogrades from 4 deg 49’ Taurus on 10 April to 24 deg 17’ Aries on 4 May and will then retrace its steps (shadow period) arriving back at 4 deg Taurus on 21 May AEST – the same day as the Sun moves into the sign of Gemini, ruled by Mercury. So enjoy the slow pace while you can!